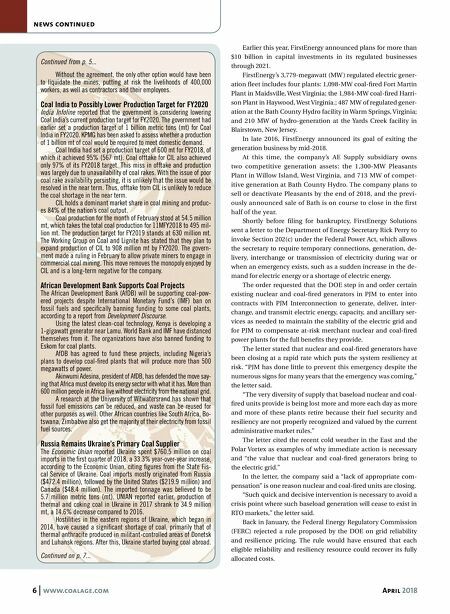 April 2018 www.coalage.com 7 news continued Continued on p. 9... Continued from p. 6... Coal-related Lawsuit Against Springfield is Dismissed A lawsuit accusing the city-owned utility in Springfield, Illinois, of costing its electricity customers millions of dollars by awarding a higher-priced coal contract to Arch Coal Inc. has been dismissed, although the attorney representing plaintiffs in the case said he plans to refile the civil complaint within a year. Jonathan Nessler said he voluntarily withdrew the suit filed in Sangamon County Circuit Court in Springfield in late 2017 be- cause of unspecified complications related to Arch's bankruptcy proceedings in the U.S. Bankruptcy Court for the Western District of Missouri in St. Louis. But he and his clients still are insistent that the city improper- ly issued a contract for steam coal from Arch's Viper underground mine near Williamsville in Sangamon County for a reduced price of $39/ton when Foresight Energy submitted a bid up to nearly $8/ton lower for coal burned in Springfield City Water, Light and Power's 580-megawatt Dallman generating station. The suit contended that the city could have saved its customers about $5 million annually in fuels costs for multiple years by pur- chasing coal from St. Louis-based Foresight instead of Arch/Viper. Foresight, owned by Ohio-based Murray Energy Corp., is the largest coal producer in Illinois, using more efficient longwall mining sys- tems at most of its operations. Viper is a room-and-pillar operation. Viper has supplied more than 1 million tons of coal annually to CWLP/Dallman for years. City officials maintained they did nothing wrong in renewing the Arch/Viper contract at the reduced price of $39/ton for five years rather than awarding the business to Foresight. The city had not yet filed a formal response to the suit before Nessler moved to have it dismissed. CWLP still is receiving coal from Viper, according to Amber Sabin, spokeswoman for the municipal electric system. Kentucky Power Gets Approval to Sell Surplus Coal Originally for Mitchell Plant Kentucky Power Co. is weighing the sale of up to 200,000 tons of Northern Appalachian (NAPP) steam coal it does not need this year to supply its 50% ownership portion of the 1,560-megawatt Mitchell power plant along the Ohio River near Moundsville, West Virginia, after receiving approval from the Kentucky Public Ser- vice Commission. The subsidiary of Columbus, Ohio-based American Electric Power Co. is committed to buying the coal this year from Con- solidation Coal Co. under a contract originally executed in 2006. Since then, Consol's underground mines in West Virginia have been acquired by Ohio-based Murray Energy Corp. and Mitchell no longer burns as much coal. In 2006, Mitchell consumed approximately 2 million tons of coal annually, the PSC said in its March order. Today, the big base- load plant burns about 1.4 million to 1.6 million tons a year, as cheaper natural gas has cut into its use. In all, Kentucky Power still is obligated to purchase 666,500 tons in 2018 and 500,000 tons in each year from 2019 through 2022 from Consol under the longstanding sales contract. 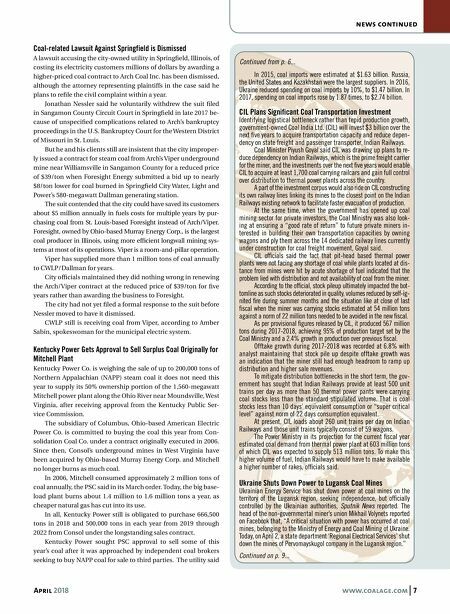 Kentucky Power sought PSC approval to sell some of this year's coal after it was approached by independent coal brokers seeking to buy NAPP coal for sale to third parties. The utility said In 2015, coal imports were estimated at $1.63 billion. Russia, the United States and Kazakhstan were the largest suppliers. In 2016, Ukraine reduced spending on coal imports by 10%, to $1.47 billion. In 2017, spending on coal imports rose by 1.87 times, to $2.74 billion. CIL Plans Significant Coal Transportation Investment Identifying logistical bottleneck rather than tepid production growth, government-owned Coal India Ltd. (CIL) will invest $3 billion over the next five years to acquire transportation capacity and reduce depen- dency on state freight and passenger transporter, Indian Railways. Coal Minister Piyush Goyal said CIL was drawing up plans to re- duce dependency on Indian Railways, which is the prime freight carrier for the miner, and the investments over the next five years would enable CIL to acquire at least 1,700 coal carrying railcars and gain full control over distribution to thermal power plants across the country. A part of the investment corpus would also ride on CIL constructing its own railway lines linking its mines to the closest point on the Indian Railways existing network to facilitate faster evacuation of production. At the same time, when the government has opened up coal mining sector for private investors, the Coal Ministry was also look- ing at ensuring a "good rate of return" to future private miners in- terested in building their own transportation capacities by owning wagons and ply them across the 14 dedicated railway lines currently under construction for coal freight movement, Goyal said. CIL officials said the fact that pit-head based thermal power plants were not facing any shortage of coal while plants located at dis- tance from mines were hit by acute shortage of fuel indicated that the problem lied with distribution and not availability of coal from the miner. According to the official, stock pileup ultimately impacted the bot- tomline as such stocks deteriorated in quality, volumes reduced by self-ig- nited fire during summer months and the situation like at close of last fiscal when the miner was carrying stocks estimated at 54 million tons against a norm of 22 million tons needed to be avoided in the new fiscal. As per provisional figures released by CIL, it produced 567 million tons during 2017-2018, achieving 95% of production target set by the Coal Ministry and a 2.4% growth in production over previous fiscal. Offtake growth during 2017-2018 was recorded at 6.8% with analyst maintaining that stock pile up despite offtake growth was an indication that the miner still had enough headroom to ramp up distribution and higher sale revenues. To mitigate distribution bottlenecks in the short term, the gov- ernment has sought that Indian Railways provide at least 500 unit trains per day as more than 50 thermal power pants were carrying coal stocks less than the standard stipulated volume. That is coal stocks less than 10 days' equivalent consumption or "super critical level" against norm of 22 days consumption equivalent. At present, CIL loads about 260 unit trains per day on Indian Railways and those unit trains typically consist of 59 wagons. The Power Ministry in its projection for the current fiscal year estimated coal demand from thermal power plant at 603 million tons of which CIL was expected to supply 513 million tons. To make this higher volume of fuel, Indian Railways would have to make available a higher number of rakes, officials said. Ukraine Shuts Down Power to Lugansk Coal Mines Ukrainian Energy Service has shut down power at coal mines on the territory of the Lugansk region, seeking independence, but officially controlled by the Ukrainian authorities, Sputnik News reported. The head of the non-governmental miner's union Mikhail Volynets reported on Facebook that, "A critical situation with power has occurred at coal mines, belonging to the Ministry of Energy and Coal Mining of Ukraine. Today, on April 2, a state department 'Regional Electrical Services' shut down the mines of Pervomayskugol company in the Lugansk region."